As part of the company’s commitment to current and future customers, 1000Bulbs.com has recently launched a new “Shop by Brand” feature in which products are organized by manufacturer. With over 14,000 products from over 100 brands, this new feature makes it easier for shoppers to browse products according to the selection available from a specific company. Customers can now simply click on the appropriate logo to view everything a supplier has to offer on the 1000Bulbs.com website. 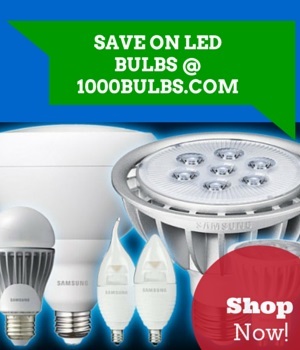 “1000Bulbs’ customers have always wanted the ability to seamlessly shop by their favorite brand. This new feature allows our customers to easily navigate and purchase from the brands they know and trust,” says CEO Kim Pedersen. Shopping by brand can be advantageous for many customers since products made by the same company tend to be of similar quality. For example, light bulbs purchased from the same manufacturer at the same time are not only more likely to emit light in the same color, but they will also have similar attributes concerning specs such as durability and life hours. Comparable advantages exist when shopping by brand for any of 1000Bulbs’ products, including hydroponic equipment, home décor, and electrical accessories. Using this feature, customers can easily find entire lamp and ballast systems, matching furniture sets, or replacement parts from a particular brand. Using the “Shop by Brand” feature, customers can quickly and efficiently locate products from tried-and-true brands such as Satco, Sylvania, Philips, and more. They can also find compatible products with ease. 1000Bulbs is dedicated to providing customers with a more satisfying online shopping experience, and shopping by brands is another step in that direction.